What medications treat coronary artery disease? What are the complications of percutaneous coronary intervention? How long is the recovery time after after percutaneous coronary intervention? What are the long-term results of percutaneous coronary intervention? Coronary angioplasty is accomplished using a balloon-tipped catheter inserted through an artery in the groin or wrist to enlarge a narrowing in a coronary artery. Coronary artery disease occurs when cholesterol plaque builds up (arteriosclerosis) in the walls of the arteries to the heart. Angioplasty is successful in opening coronary arteries in well over 90% of patients. Up to 30% to 40% of patients with successful coronary angioplasty will develop recurrent narrowing at the site of balloon inflation. The use of newer devices such as intracoronary stents and atherectomy, as well as newer pharmacologic agents has resulted in higher success rates, reduced complications, and reduced recurrence after percutaneous coronary intervention. Currently, the recurrence rate after stent is under 10%. 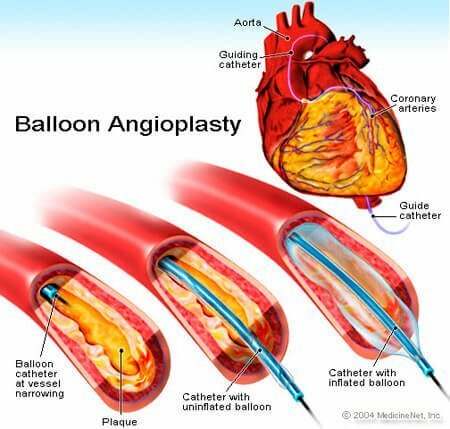 Balloon angioplasty of the coronary artery, or percutaneous transluminal coronary angioplasty (PTCA), was introduced in the late 1970's. PTCA is a non-surgical procedure that relieves narrowing and obstruction of the arteries to the muscle of the heart (coronary arteries). This allows more blood and oxygen to be delivered to the heart muscle. PTCA is now referred to as percutaneous coronary intervention, or PCI, as this term includes the use of balloons, stents, and atherectomy devices. Percutaneous coronary intervention is accomplished with a small balloon catheter inserted into an artery in the groin or wrist, and advanced to the narrowing in the coronary artery. The balloon is then inflated to enlarge the narrowing in the artery. When successful, percutaneous coronary intervention can relieve chest pain of angina, improve the prognosis of individuals with unstable angina, and minimize or stop a heart attack without having the patient undergo open heart coronary artery bypass graft (CABG) surgery. In addition to the use of simple balloon angioplasty, the availability of stents, in a wire-mesh design, have expanded the spectrum of people suitable for percutaneous coronary intervention, as well as enhanced the safety and long-term results of the procedure. Since the early 1990's, more and more patients are treated with stents, which are delivered with a percutaneous coronary intervention balloon, but remain in the artery as a "scaffold". This procedure has markedly reduced the numbers of patients needing emergency CABG to below 1%, and particularly with the use of the new "medicated" stents (stents coated with medications that help prevent recurrence due to scar tissue), has reduced the rate of recurrence of the blockage in the coronary artery ("restenosis") to well below 10%. At present, the only patients treated with just balloon angioplasty are those with vessels less than 2mm (the smallest diameter stent), certain types of lesions involving branches of coronary arteries, those with scar tissue in old stents, or those who cannot take the antiplatelet blood thinners after the procedure. Various "atherectomy" (plaque removal) devices were initially developed as adjuncts to percutaneous coronary intervention. These include the use of the excimer laser for photoablation of plaque, rotational atherectomy (use of a high-speed diamond-encrusted drill) for mechanical ablation of plaque, and directional atherectomy for cutting and removal of plaque. Such devices were initially thought to decrease the incidence of restenosis, but in clinical trials were shown to be of little additional benefit, and now are only used in selective cases as an adjunct to standard percutaneous coronary intervention (percutaneous artery intervention). Arteries that supply blood and oxygen to the heart muscles are called coronary arteries. Coronary artery disease (CAD) occurs when cholesterol plaque (a hard, thick substance comprised of varying amounts of cholesterol, calcium, muscle cells, and connective tissue, which accumulates locally in the artery walls) builds up in the walls of these arteries, a process called arteriosclerosis. Over time, arteriosclerosis causes significant narrowing of one or more coronary arteries. When coronary arteries narrow more than 50% to 70%, the blood supply beyond the plaque becomes inadequate to meet the increased oxygen demand of the heart muscle during exercise. Lack of oxygen (ischemia) in the heart muscle causes chest pain (angina) in most people. However, some 25% of those with significant coronary artery narrowing experience no chest pain at all despite documented ischemia, or may only develop episodic shortness of breath instead of chest pain. These people are said to have "silent angina" and have the same risk of heart attack as those with angina. When arteries are narrowed in excess of 90% to 99%, people often have angina at rest (unstable angina). When a blood clot (thrombus) forms on the plaque, the artery may become completely blocked, causing death of a part of the heart muscles (heart attack, or myocardial infarction). The arteriosclerotic process can be accelerated by smoking, high blood pressure, elevated cholesterol levels, and diabetes. Individuals are also at higher risk for arteriosclerosis if they are older (greater than 45 years for men and 55 years for women) or if they have a positive family history of coronary heart disease. The resting electrocardiogram (EKG, ECC) is a recording of the electrical activity of the heart, and can show changes indicative of ischemia or heart attack. Often, the EKG in individuals with coronary artery disease is normal at rest, and only becomes abnormal when heart muscle ischemia is brought on by exertion. Therefore, exercise treadmill or bicycle testing (stress tests) are useful screening tests for those with significant coronary artery disease (CAD) and a normal resting EKG. These stress tests are 60% to 70% accurate in diagnosing significant coronary artery disease. If the stress tests are not diagnostic, a nuclear agent (Cardiolite or thallium) can be given intravenously during stress tests. Addition of one of these agents allows imaging of the blood flow to different regions of the heart, using an external camera. An area of the heart with reduced blood flow during exercise, but normal blood flow at rest, signifies substantial artery narrowing in that region. Stress echocardiography combines echocardiography (ultrasound imaging of the heart muscle) with exercise stress testing. It is also an accurate technique for detecting coronary artery disease. When a significant narrowing exists, the heart muscle supplied by the narrowed artery does not contract as well as the rest of the heart muscle. Stress echocardiography and thallium stress tests are 80% to 85% accurate in detecting significant coronary artery disease. When a person cannot undergo an exercise stress test because of neurological or arthritic difficulties, medications can be injected intravenously to simulate the stress on the heart normally brought on by exercise. Heart imaging can be performed with either a nuclear camera or echocardiography. Cardiac catheterization with angiography (coronary arteriography) is a technique that allows X-ray pictures to be taken of the coronary arteries. It is the most accurate test to detect coronary artery narrowing. Small hollow plastic tubes (catheters) are advanced under X-ray guidance to the openings of coronary arteries. Iodine contrast "dye" is then injected into the arteries while an X-ray video is recorded. Coronary arteriography gives the doctor a picture of the location and severity of narrowed artery segments. This information is important in helping the doctor select medications, percutaneous coronary intervention, or coronary artery bypass graft surgery (CABG) as the preferred treatment option. A newer, less invasive technique is the availability of high speed CT coronary angiography. While it still involves radiation and dye exposure, no catheters are needed in the arterial system, which does decrease the risk of the procedure somewhat. This modality has a more limited role, in that, it is less questionable than conventional angiography and cannot allow PCF to be done the same time. It is important to remember that the risk of serious complications from conventional coronary angiography is very low (well under 1%). Angina medications reduce the heart muscle's demand for oxygen in order to compensate for the reduced blood supply, and also may partially dilate the coronary arteries to enhance blood flow. Three commonly used classes of drugs are the nitrates, beta blockers, and calcium blockers. A newer fourth agent, ranolazine (Ranexa) is of value. Many people benefit from these angina medications and experience reduction of angina during exertion. When significant ischemia still occurs, either with ongoing symptoms or with exercise testing, coronary arteriography is usually performed, often followed by either percutaneous coronary intervention or CABG. 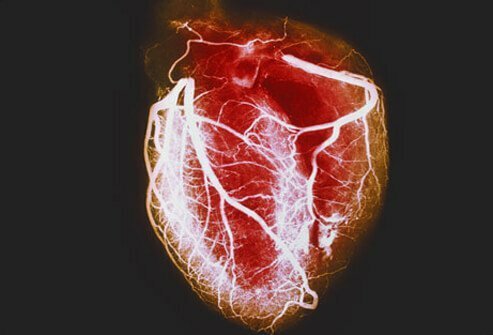 Individuals with unstable angina have severe coronary artery narrowing and often are at imminent risk of heart attack. In addition to angina medications, they are given aspirin and the intravenous blood thinner, heparin. A form of heparin, enoxaparin (Lovenox), may be administered subcutaneously, and has been demonstrated to be as effective as intravenous heparin in those with unstable angina. Aspirin prevents clumping of blood clotting elements called platelets, while heparin prevents blood from clotting on the surface of plaques. Potent IV antiplatelet agents ("super aspirins") are also available to help initially stabilize such individuals. While people with unstable angina may have their symptoms temporarily controlled with these potent medications, they are often at risk for the development of heart attacks. For this reason, many people with unstable angina are referred for coronary angiography, and possible percutaneous coronary intervention or CABG. Percutaneous coronary intervention can produce excellent results in carefully selected patients who may have one or more severely narrowed artery segments which are suitable for balloon dilatation, stenting, or atherectomy. During percutaneous coronary intervention, a local anesthetic is injected into the skin over the artery in the groin or wrist. The artery is punctured with a needle and a plastic sheath is placed into the artery. Under X-ray guidance (fluoroscopy), a long, thin plastic tube, called a guiding catheter, is advanced through the sheath to the origin of the coronary artery from the aorta. A contrast dye containing iodine is injected through the guiding catheter so that X-ray images of the coronary arteries can be obtained. A small diameter guide wire (0.014 inches) is threaded through the coronary artery narrowing or blockage. A balloon catheter is then advanced over the guide wire to the site of the obstruction. This balloon is then inflated for about one minute, compressing the plaque and enlarging the opening of the coronary artery. Balloon inflation pressures may vary from as little as one or two atmospheres of pressure, to as much as 20 atmospheres. Finally, the balloon is deflated and removed from the body. Intracoronary stents are deployed in either a self-expanding fashion, or most commonly they are delivered over a conventional angioplasty balloon. When the balloon is inflated, the stent is expanded and deployed, and the balloon is removed. The stent remains in place in the artery. Atherectomy devices are inserted into the coronary artery over a standard angioplasty guide wire, and then activated in varying fashion, depending on the device chosen. CABG surgery is performed to relieve angina in those whose illness has not responded to medications and are not good candidates for PCI. CABG is best performed in patients with multiple blockages in multiple locations, or when blockages are located in certain arterial segments which are not well-suited for percutaneous coronary intervention. CABG is often also used in patients who have failed to attain long-term success following one or more percutaneous coronary intervention procedures. CABG surgery has been shown to improve long- term survival in people with significant narrowing of the left main coronary artery, and in those with significant narrowing in multiple arteries, especially in cases of decreased heart muscle pump function. Percutaneous coronary intervention, using balloons, stents, and/or atherectomy can achieve effective relief of coronary arterial obstruction in 90% to 95% of patients. In a very small percentage of individuals, percutaneous coronary intervention cannot be performed because of technical difficulties. These difficulties usually involve the inability to pass the guide wire or the balloon catheter across the narrowed artery segments. The most serious complication of percutaneous coronary intervention results when there is an abrupt closure of the dilated coronary artery within the first few hours after the procedure. Abrupt coronary artery closure occurs in 5% of patients after simple balloon angioplasty, and is responsible for most of the serious complications related to percutaneous coronary intervention. Abrupt closure is due to a combination of tearing (dissection) of the inner lining of the artery, blood clotting (thrombosis) at the balloon site, and constriction (spasm) or elastic recoil of the artery at the balloon site. When stents are placed patients are started on aspirin as well as a second agent for up to a year or more depending on the type of stent. These agents are clopidogrel (Plavix), prasugrel (Effient), and ticagrelor (Brilinta) may be given as an IV agent when the stent is placed for patients who cant take pills. The incidence of abrupt occlusion after percutaneous coronary intervention has declined dramatically with the introduction of coronary stents, which essentially eliminate the problem of flow-limiting arterial dissections, elastic recoil, and spasm. The use of new intravenous "super aspirins", which alter platelet function at a site different from the site of aspirin-inhibition, have dramatically reduced the incidence of thrombosis after balloon angioplasty and stenting. When despite these measures, a coronary artery cannot be "kept open" during percutaneous coronary intervention, emergency CABG surgery may be necessary. Before the advent of stents and advanced anti-thrombotic strategies, emergency CABG following a failed percutaneous coronary intervention was required in as many as 5% of patients. In the current era, the need for emergent CABG following percutaneous coronary intervention is less than 1% The overall acute mortality risk following percutaneous coronary intervention is less than one percent; the risk of a heart attack following percutaneous coronary intervention is only about 1% to 2%. The degree of risk is dependent on the number of diseased vessels treated, the function of the heart muscle, and the age and clinical condition of the patient. Percutaneous coronary intervention is performed in a special room fitted with computerized X-ray equipment called a cardiac catheterization laboratory. Patients are mildly sedated with small amounts of diazepam (Valium), midazolam (Versed), morphine, and other sedative narcotics given intravenously. Patients may experience minor discomfort at the site of the puncture in the groin or the arm. Patients also may experience brief episodes of angina while the balloon is inflated, briefly blocking the flow of blood in the coronary artery. The percutaneous coronary intervention procedure can last from 30 minutes to two hours, but is usually completed within 60 minutes. Patients are then brought to a monitored bed for observation. The plastic catheters left in the artery are removed from the groin after four to 12 hours depending on how long blood thinning is needed to stabilize the opened artery. When these catheters are removed, the area is compressed by hand or with the aid of a mechanical clamp for about 20 minutes to prevent bleeding. In many instances, the artery in the groin may be sutured or "sealed" in the catheterization laboratory, and the catheters are immediately removed. This enables the patient to sit up in bed within a few hours after the procedure. Most patients are discharged home the day after percutaneous coronary intervention. Patients are advised not to lift anything heavier than 20 pounds or perform vigorous exertion for the first one to two weeks after percutaneous coronary intervention. This allows the area in the coronary artery as well as the groin or arm arteries to heal. Patients may return to normal work and sexual activity two or three days after percutaneous coronary intervention. Patients are maintained on aspirin indefinitely after percutaneous coronary intervention to prevent future thrombotic events (for example, unstable angina or heart attack). In patients who receive stents, an additional anti-platelet agent [in most instances clopidogrel (Plavix)]) is given in conjunction with aspirin for one year; this is because the metal in the stents may promote the formation of blood clots after the stent is inserted. Cholesterol reduction is often aided by the addition of medications which may not only lower cholesterol levels, but may offer protection against future heart attacks. Long-term benefits of percutaneous coronary intervention depend on the maintenance of the newly-opened coronary artery(ies). Thirty to fifty percent of patients with successful balloon angioplasty (no stent) may develop recurrent narrowing (restenosis) at the site of the balloon inflation, usually within six months following percutaneous coronary intervention. Patients may complain of recurrence of angina or may have no symptoms. Restenosis is often detected by exercise stress tests performed at four to six months after percutaneous coronary intervention. Restenosis occurs with a significantly higher frequency in people with diabetes. The rate of restenosis is greater in vein grafts, at the origins of vessels, in the beginning part of the left anterior descending coronary artery, and in those with suboptimal initial results. The widespread use of intracoronary stents has reduced the incidence of restenosis by as much as 50% or more; this is due to prevention of "elastic recoil" in the artery, as well as providing a larger initial channel in the treated artery. With the newer medicated stents, the restenosis rate is well under 10%. Restenosis can simply be observed or treated with medications if the narrowing is not critical and the patient is not symptomatic. Some patients undergo a repeat percutaneous coronary intervention to increase coronary artery blood flow. Second percutaneous coronary intervention procedures have similar initial and long-term results as first procedures, although certain patterns of restenosis have a very high repeat recurrence rate. Sometimes, CABG surgeries are recommended for those patients who have developed more extensive disease in the restenosed artery as well as in the other coronary arteries. Patients may also choose CABG surgery to avoid the uncertainty of restenosis after the second percutaneous coronary intervention. In patients with restenosis after balloon angioplasty or stents, the use of intracoronary radiation (brachytherapy) may reduce the risk of future restenosis. If no evidence of restenosis is observed after six to nine months, studies have demonstrated that the treated arterial segment is likely to remain open for many years. "Late restenosis" after one year or more is very uncommon. Symptoms developing more than one year after successful percutaneous coronary intervention are usually due to blockage in a different segment of the artery or in a different artery from that which was treated in the initial percutaneous coronary intervention. REFERENCE: eMedicine.com. "Percutaneous Transluminal Coronary Angioplasty". How was your coronary artery disease diagnosed? Explain your experience in recovery from your angioplasty and stent procedure. Did you experience any complications? Did your artery narrowing recur after your angioplasty? Please share your experience with coronary angioplasty and stents.